Schedule Your Window 7 PC To Shutdown Automatically. No matter the reason you may need if for, the thought or idea of having a device turn off automatically based on scheduled turn off setting is something that might sound not related to PC but to Smartphone. But this does not mean that you cannot set your PC so that it will automatically shut itself down at a specific time. In fact, that is what this article is design to help you do. So if you are using a PC that uses Window 7 OS, the following steps outline below will help you schedule your PC (Personal Computer) so that it will shut down at a certain time, specified by you. Step 3: In the Create Basic Task Wizard dialogue box that pop up, type a Name and Description. It can be anything that will help you remember at a later time that, this task is for automatically shutting down your PC. Something like “PC Auto Shutdown” might be good, but anything you type will be accepted. Step 4: After you have type a Name and a Description, click Next. Step 5: On the next screen titled Task Trigger check daily and click Next. Once done you will be asked to specify when you will like this feature/task to start working, and by what time of the day. 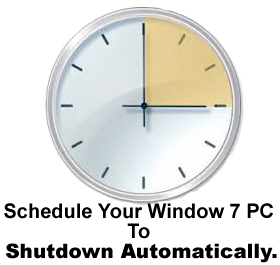 Specify the date and time of your choice and leave the Recur every field to 1. If you change it to 2 for example, then the automatic shutdown will happen once every two days instead of every day. Step 6: On the next screen titled Action, choose Start a program and click Next. Step 7: On the Start a Program screen, type C:\Windows\System32\shutdown.exe in the Program/script text field and /s in the Add arguments (optional) text field. And click Next. Step 8: Review your setting in the Summary screen that appears next and click Finish to confirm. That is all. After that your PC which OS is Window 7 will automatically shutdown at the same time you specify in Step 5 every day, or as you specify in the Recur every text field in Step 5.